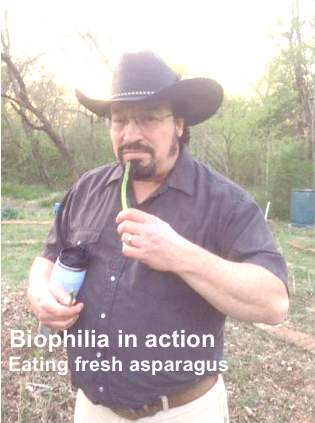 Some members of the Garland Flamingo Neighbors Group were able to experience Biophilia (love of living things) in action yesterday evening during a tour of the Garland Community Garden. Have you ever picked and eaten raw vegetables while you were in the garden? If not, we know lots of folks who recommend it. Yesterday Jane Stroud (President of Loving Garland Green) and I hosted a tour of the Garland Community Garden for Ana Maria DeYoung and a group of members from the Garland Flamingo Neighbors group. It is so much fun and so fulfilling to share the Garland Community Garden with others. Leading these tours offers special feel-good rewards as well. For example, Jane and I discovered that our Garland Community Garden apricot tree has 18 apricots and our resident peach tree has over 30 peaches. Both fruit trees were donations from founding members, Gene and Margie Rodgers. Many of the blackberry bushes are already blooming and even our nearly new pear tree has one blossom this year. You'll never step into the same garden twice as gardens are teeming with life that is constantly evolving--Just like you and me. Today there were apricots and a plethora of blackberry blossoms that were not there three days ago. Whenever possible and safe, it’s a good idea to eat raw vegetables as some of them, such as raw asparagus, are prebiotics that are very good for our digestive system as they are essential food for probiotics. But even better than the scientific/medical reasons, fresh raw vegetable picked and eaten right in the garden taste good and provide a great first-hand connection to nature. It was our first planned public tour of the Garden this year. Of course we have had many impromptu and delightful tours for individuals who stop in at the garden, but this was the first one in 2017 that was planned and involved a group. The Garland Flamingo Neighbors group has been in existence for several years. The group is a perfect example of grassroots efforts of neighbors who care enough to take the time to get to know one another and work together in neighborhood crime watch efforts and community activities.